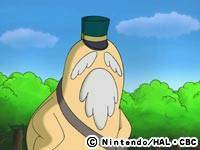 Melman (Moso in Japan) is probably the oldest Cappy in town, and is also the only mailman. His memory's still pretty good, since he knows where to find just about anyone to give them a letter! In the episode "Born to Be Mild - Part II", it is discovered that he is also the legendary biker, Steppenwolf. What was he like when he was younger is nothing but a mystery.